Often regarded as difficult to tune, there is still a large number of modifications that can be made to the Zetec engine to increase power, from simple filter and exhaust upgrades to throttle bodies and turbo conversions. Many options exist to suit all budgets and while it may not respond as eagerly as its turbocharged relatives, the naturally aspiration version can still prove a worthy powerplant. Read on to discover what can be done, we’ll start with the basics. In comparison with the CVH and other earlier Ford engines, the Zetec does not respond particularly well to the usual breathing modifications. This is due to advancements in engine technologies and running costs leading to manufacturers squeezing as much power as possible from the engine by ensuring the components are as well designed as possible. Changing the filter from standard to a “Performance Panel” or “Induction Kit” won’t increase the power, just the air induction noise. Likewise, a freer flowing exhaust system will produce a marginal increase in power, if any, and this will more than likely be down to replacing an old blocked system with a brand new one. A change of camshafts will only provide a minor improvement - 10bhp at most. Chipping a Zetec is more for driveability than power. The purpose of the chip is to remove any compromises that the manufacturers have made for economy and reliability. The first thing to be aware of is that the 1.6 90ps unit fitted in the Si 16v and Ghia 16v is hugely restricted by it’s tiny 26mm valves and will struggle to produce over 100bhp, even with major modification. Due to the bore size, the larger valve (32mm) heads from the 1.8 and 2.0 cannot be fitted. The only effective solutions to gain more power from these cars is Nitrous Oxide kits or transplanting the 1.8 or 2.0. This engine was fitted with a number of different parts to the 130ps (RS1800) engine, these being: ECU - the RS1800s were fitted with a well tuned ECU which released the 1800cc engine’s full potential when coupled with the larger throttle body and cams. Throttle body - the 105ps engine’s throttle body is physically almost identical to the 90ps throttle body and is a major restriction. Cams - the 130ps spec cams from the RS1800 130ps engine are the same as those used in the 2.0L 136ps Mondeo engines, and very similar to the 136ps Focus cams. Under-piston oil sprays - although not vital, if you can have these fitted they will prolong the life of your engine and help to keep the combustion cylinder temps down. To fit these parts new from Ford would cost in excess of £1,000. However, second hand parts are widely available, and certain Mondeo 2.0L parts can be used, including 93-95 ECUs and all 2.0L cams (which are the same part number). The Mondeo and Focus 2.0L 136ps throttle body can also be used, but you will need to swap the throttle cable bracket in order to make it fit. Once you have the 130ps engine spec, the next steps in tuning are to improve induction and exhaust flow, and look at a remap and higher lift cams. However, many tuners agree that the maximum power you can achieve on the 1800 Zetec inlet manifold and injectors is 145-155bhp, and you will be pushing the engine and management to its limits at this point. Aftermarket normally-aspirated cam kits cost in the region of £450-£500 and will be unsuitable to turbocharged applications. A free-flowed exhaust and removal of the catalytic converter, as well as the fitting of the Mass AirFlow sensor (MAF) from a 2.0L engine (which has a larger internal diameter than the 1800 MAF) will give good mid-range gains, and a custom-mapped management chip such as a Unichip will allow the best gains from these modifications. The catalytic converter, fitted to every Ford from 1992 onwards, has it’s good and bad points. Once up to operating temperature in the high hundreds of degrees C, the honeycomb surface of the cat, which is coated in precious metals, acts to change the molecular structure of the gases passing over it from undesirable gases and unburnt fuel, into more environmentally friendly stuff, as well as reducing noise levels. The downside of having a cat is the increase in exhaust system backpressure, which tends to help increase bottom end torque at the expense of bhp at the top of the rev-range. 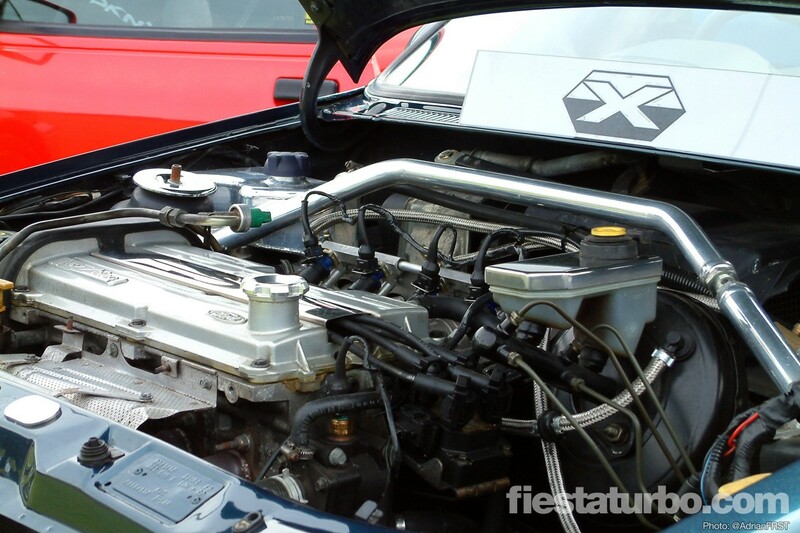 Removal tends to free up the engine, making it rev more freely, and an increase in peak power is often found. However, although the emissions regulations don’t actually require you to have a cat, if your car is made after 1992 your emissions will be expected to be at or below a certain level, which is almost impossible to achieve without a catalytic converter fitted. One last point: lambda probes. This is a small self-heating narrow-band exhaust gas oxygen sensor sitting, usually, just in front of the cat. It tells the ECU how rich your engine is and adjusts fuelling to suit. This is a vital part of the car’s management for almost every single management system. We have heard of cars that have had an aftermarket exhaust fitted and the “specialist” making up the exhaust claimed that the lambda probe wasn’t important, and cut it out of the loom. The car now gets about 100 miles to a tank (it should be getting 250) and is undriveable when it is cold. If you remove your cat and straight away the car misbehaves, especially when cold, you should check and if necessary replace the lambda probe. Note that VAG recommend these are changed every 60k miles on their cars, so if your car is well over this mileage you may want to enquire at your local motor factor’s about the price of a replacement. If you’re serious about getting more power from your engine than the methods above can offer, then you should be considering either forced induction, which on a budget of around £3,000-£5,000 can give you in the region of 250-280bhp, or normally aspirated tuning with a budget of £1,000 and upwards through the use of twin-carburettors or throttle bodies can give well over 200bhp with a good set-up. Before proceeding to even research into fitting dual twin choke carburettors to a Zetec, it’s important to be aware of the MOT emission regulations in force. With the exeption of a few very early Zetecs, the emission levels of a carb’d Zetec will be too high to pass the revised 1992 regulations, thus causing the car to fail it’s MOT. There are a number of companies who sell carb kits for Zetecs, but these are intended to be used in kit and competition cars, where emissions are less strict. Having said that, if the car itself was produced before 1992, eg a G plate 1.6s, it’s perfectly legal to run carbs on a Zetec engine. Only post 1992 cars are affected. The conversion itself replaces the EFi inlet manifold and injection system and provides power gains of approximately 30bhp on a 2.0, and gives the engine note a purposeful throaty burble. The downsides are an increase in fuel consumption and poor bottom end driveability, especially in cold weather. Throttle bodies work on the same principal as carbs, with an air intake for each cylinder, but are controlled by the ECU and fuel is supplied through electronic injectors as with the Zetec’s conventional EFi system. Power gains are similar to carbs, but without the rough running and high emission levels when properly set-up. Throttle bodies will require an aftermarket ECU, such as Omex, Gems or DTA, and a mapping session to set them up. This setup can be taken even further. Forged pistons to increase engine compression (11.5:1 is common for road-going cars and track cars on race fuel can be taken much higher) result in better combustion but the use of a high octane fuel will be necessary. A steel crank and rods with uprated bolts allow higher maximum RPM’s and greater power outputs - Ford’s super 1600 rally Puma engine revs beyond 9,000rpm and produces over 200bhp (normally aspirated!). For more information, a reputable engine tuning company will be able to offer you advice on what route to take. Written and re-edited by Adrian, edited by Project.